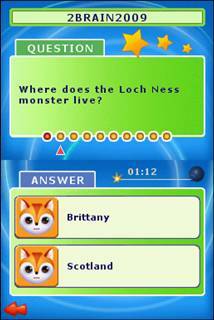 After Dr. Kawashima’s Brain Training proved to be hit with the new audience opened up by the Nintendo DS’s accessibility, it gave birth to a new genre of games that stimulate the mind. Who knew that people would find solving simple maths problems and working out logic puzzles fun and deeply fulfilling, but they did and according to research, improved their brain power at the same time. 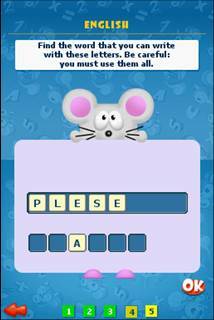 Junior Brain Trainer is a game that attempted to realise this potential market and tailor the experience to a younger audience. 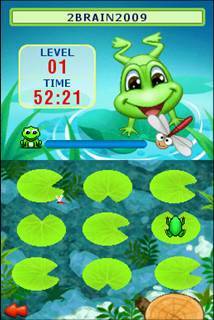 Junior Brain Trainer 2 tries to improve on the original with new puzzles and activities, while retaining their target audience of those ages 6-11. Starting up, you are greeted by three save slots for you to fill your name and age in, and select your gender, meaning you and two others can have separate save files recording your progress. You also have a choice of two difficulties: progressive, where the questions get harder as you work through the game; or pot luck, where the level of challenge is constantly changing and the activities are a random selection of difficulties. 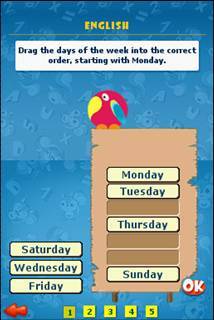 Similarly to Dr. Kawashima’s Brain Training, play consists of a daily challenge for you to complete made up of 5 different activities. The activities aim to train and practice the skills learnt at school. Reading and writing activities have you constructing sentences from a set of options to describe a scene, finding the missing letters to form words, and adding missing words to form sentences. Addition and subtraction calculations briefly cover the numerical side of things, encouraging the use of the primary school ‘borrowing’ method – forcefully thrust upon you so that even if you can get the right answer, you still need to fill out the ‘borrowing’ answers before it lets you move on. Then finally, a few activities offer more general practice with certain skills, like geometrical puzzles involving shapes and adjusting a clock face to the necessary time. Each time you meet your daily schedule requirements and complete these 5 activities, you are rewarded with one of the 26 unlockable ‘bonus activities’. These are unlocked in a specific order, from thereon playable as much as you like, and come under the different categories of ‘Hangman’, ‘Quiz’ and ‘Games’. With 26 activities to unlock, technically speaking, the game lasts a minimum of 26 days, although this does mean that from the start, everything is locked away, resulting in the game feeling very closed off and barren as all the menus are filled with disabled game modes. By having nothing on offer from the start, it promotes short play sessions because, aside from the daily challenge, there will be little else to spend your time on. Unfortunately, for those who want to speed up the opening of new things to play, the date and time settings are locked in from the start, meaning manipulating the DS’s clock and calendar won’t allow you to receive bonus activities any faster. Also, I found it to be very unclear what time basis the game was operating on, because despite it being said to be a daily challenge, on occasion when hopping on the next day to undergo the challenge and unlock another activity I was met by a message saying I had already done my challenge for the day – that I could replay to revise if I liked, but wouldn’t be rewarded with another bonus activity. Even leaving it 24 hours didn’t always work, leading me to question whether one daily cycle was done by change of date or an elapsed time period. When combined with sometimes unclear tasks set involving moving panels, this makes the game overly finickity and far too confusing for the young target audience. On the other hand, the rest of the user interface has been shaped with children in mind. For a start, the bright colour scheme and clear layout of the rest of the game aside from a few problem areas makes it easy to navigate through the different screens. A small woodland critter wanders by every so often, acting as your guide by contributing any advice he has to share, but the result of the whole kid-friendly feel the developers have tried to create seems mismatched to the task at hand. This is particularly apparent in the irritating music on a loop, which is completely unsuited to completing calculations and doing thought based puzzles. As such, even the most tolerable of children will have muted it from the main menu or turned the sound slider to zero after a few short minutes. 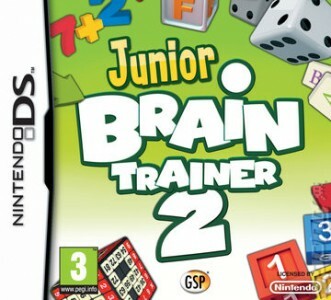 In trying to cater specifically for a younger audience, Junior Brain Trainer 2 has had a number of both hits and misses. The overall design, level of difficulty and type of challenges is well matched to the younger end of the scale to build on and practice the basics they’ve been studying at school. The problems come due to the fact that, from the start, the entire game is closed off and has to be gradually unlocked. While this does encourage short 5-10 minute play sessions, it also means that initially there’s barely any playing material, and considering the fiddly way in which the bonus activities unlock (or for that matter, often don’t) many may just give up. It’s adequate for patient youngsters, although those two words don’t always go hand – plus the upper end of the suggested age spectrum would do well to pick up Dr Kawashima’s Brain Training instead, as it will prove to be a more challenging, longer-lasting brain training tool. To be in with a chance of winning a copy of the game, leave a comment below. One comment entry per person. Open to residents of the UK only – apologies to our readers from elsewhere around the world!